She was well-preserved for someone who'd been dead twenty years. Strapped for cash, she opens a private investigator business. Who offers to be her first client? No other than her great aunt Lucy—an aunt who has been dead for at least twenty years. When Lana meets Tony and his grandfather, the case takes on a life of its own. Tony is reluctant to help because his family blames Lucy for his grandfather's death. They all work on a plan together . . . a plan that could bring all the probable suspects together in one place. Will Lana and her friends be able to solve the twenty-year-old double murder in time? If they can, the ghosts will spend eternity together. If they can’t, they’re stuck as Haunted Hearts. 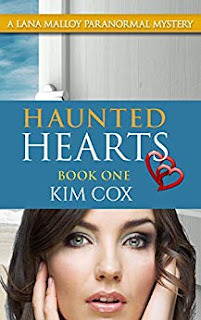 If you enjoy a great ghost story, a laugh or two, and an exciting mystery you'll love Haunted Hearts. Get it now.